Than Thein takes a look at post-production image manipulation that brings out the true look of your corals without going “over the top”. Often the subject of heated online debate is the post processing of coral photos. Post processing refers to the manipulation of the coral image by software to tweak color and exposure levels. Post processing of coral images is a particularly hot-button issue because it is possible to abuse it. Hobbyists unfamiliar with the practice may decide to purchase a coral online based on a stunning photo and be disappointed once they receive it because the photo was the result of heavy post processing. Some in the reef-keeping hobby associate post processing with deceptive trade practices, which is unfortunate because post processing is merely a tool. That may be an understatement, because post processing is half of digital photography. Let me repeat that: post processing is half of photography. Let’s say, for example, that you are hiring a wedding photographer, and the first candidate proclaims he doesn’t do any post processing and whatever comes straight out of the camera is what makes it to print. If it were my wedding, I would strongly consider other photographers. Implying that an image shot by the camera left unaltered is somehow more “pure” or “less fake” than one that has been post processed is a misunderstanding of what is actually occurring. A digital camera is very much an analog light-gathering device. Without getting too deeply into digital sensor discussion, one can imagine a digital sensor as an array of buckets that collect light. The camera then measures those buckets of light and converts them into digital information, namely 1’s and 0’s, that is packaged into a single file. It is not possible to view this file directly. It is not a visible image, it is just data. What pops up as a preview is one of an infinite number of conversions of this data into a visible image. In essence, the camera is doing the processing for you. The moment you can see an image it has, by definition, been processed. The question is whether the camera can do a better job of processing an image than a professional software program can. In most cases, the answer is no. Cameras today do a much better job of cranking out quality .jpeg files compared to years past. However, nothing really beats the ability to fine-tune an image to exactly the appearance that is desired. In fact, some of the higher-end cameras put out a file that gives the photographer the most latitude in post processing. This is especially true in cinema. Manufacturers of high-end cinema cameras such as Arri and RED put out a file that looks bad on first glance. The picture is gray and flat by design. That image is designed to have the most image information possible for the editors to color grade it in post. In this case, the more gray and flatter the image, the better. If my wedding videographer showed up with a $60,000 RED camera and said he was going to make an untouched video of what came out of the camera, I can assure you it would look horrible. The key point here is “most cases.” It is entirely possible to butcher an image using professional tools, and that is a situation worth avoiding as well. 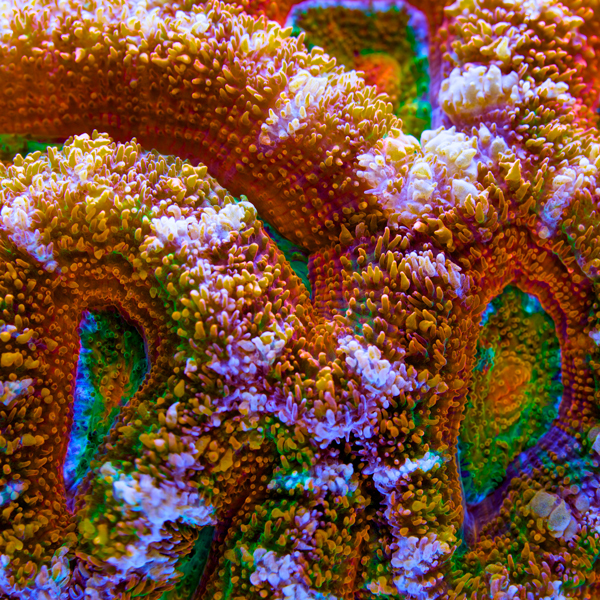 Most people taking pictures of coral are not professional colorists, and the results can be all over the board. 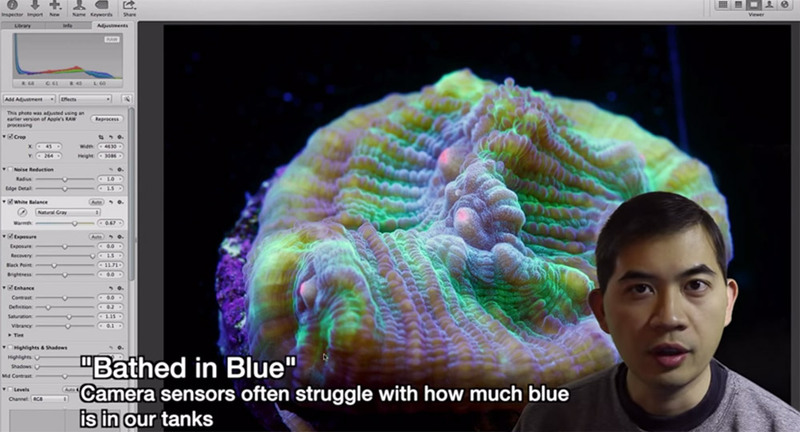 There is a high likelihood that people in the coral industry will continue to over-process images, so it is important to know the telltale signs to avoid future disappointment. In a professional photo editing suite there are numerous options available to manipulate a photo. Having said that, there are three ways that an image typically gets edited: white balance, black point, and saturation. 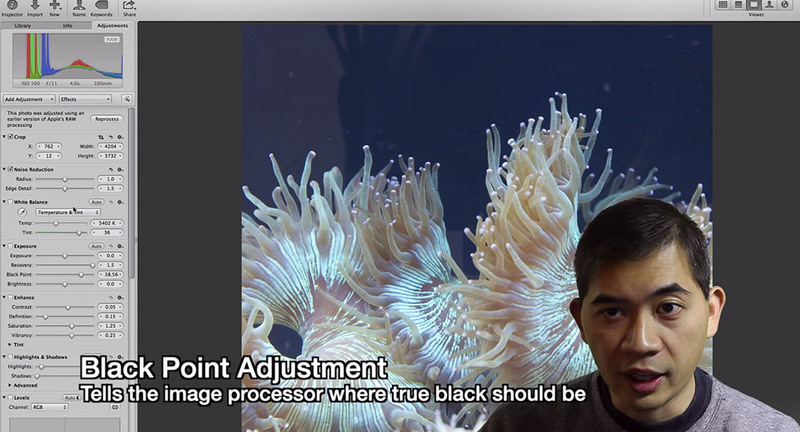 Than Thein talks you through white balance adjustments. Despite its name, white balance affects the color temperature of the image. By changing the white balance of the image, one can change the look of the coral from a daylight appearance to actinic. It is a very powerful manipulation, akin to changing the program of a LED fixture, but done to a still image. Black point adjustments affect how dark the darkest spots in the image are. Some pictures have a washed-out look because the portions of the image that are supposed to be black are represented as gray. The result is a hazy-looking image. Than Thein discussing black point adjustments to bring washed out photos back to life. By setting the black point, those areas fall off into a deep black, and that gives the entire image a much more contrasting look. Saturation is an adjustment that affects the vibrancy of the color in the image. If there is a single adjustment that photographers in this industry abuse above all others, it is saturation. One can imagine saturation is like a volume dial for color. By turning it up, it is possible to get a hyper-colorful image out of an otherwise pedestrian looking photo. 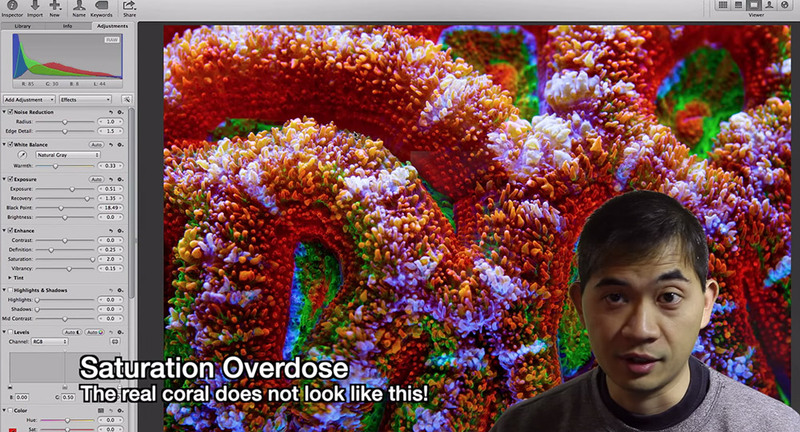 The author talking about and demonstrating “saturation overdose” in reef aquarium photography post production. One telltale sign that an image has been over-saturated is the presence of large blobs of color where there is no detail, just a single glob of paint. Cameras today are capable of resolving incredible detail, so for an image to almost completely lack detail should be unusual. In conclusion, post processing is a powerful tool and an integral part of photography. Like every powerful tool, it is prone to misuse, so it is important to be aware when it happens and to adjust expectations accordingly.